Does your child have an IEP? Do you keep your files nice and neat or are there copies of papers piled in various locations throughout the house? I was the mom who had papers everywhere. Seriously, Riley’s paperwork was EVERYWHERE. It was in the den, my bedroom, my closet, the kitchen, the dining room, the car. I needed help. I needed an IEP Organizer. The IEP organizers that I’ve found for sale were great, they really were. Although it wasn’t exactly what we needed for Riley, they did provide guidance on things I would have never thought of. I made changes to some of the documents that were useful to accommodate more of what we needed, and added additional pages needed for us and voila! We have a handy-dandy notebook. No wait, that’s Blue’s Clues. What we had was total organization. I set out on a several-month-long mission to get it together. Let’s face it, I’ve been frazzled, fried and fricasee’d. I’ve been trying to figure out what works for us, how to easily communicate during IEP meetings (think “preparing” in advanced), and ways to help Riley’s teacher and aides adjust to her way of life. The struggle is real. If you read my post about struggling with the last-minute details, I’m sure you can relate. This document evolved from just organizing Riley’s IEP documents, to also being a place to capture communications between IEP team and our family as well as between the school and our family. It also has a “Get to Know Me” document for helping the teachers with some pretty basic-to-us information about Riley. This was my favorite part of the document. I totally wrote it from the perspective of Riley. At first, I thought I was wasting my time. Really, who’s going to read all that information? It was only two pages, but there was a lot of info. Then something amazing happened. The “book” gets handed back and forth between our family and the school. There are places for notes for the staff to write in to communicate whatever they want with us. Wouldn’t you know it? The OT wrote how wonderful a document it was and that she would incorporate some of the things Riley likes to do in a therapy session. Score one for this momma! This was a great victory for me, we don’t get many these days. We’re not losing, either. I’ll take stable any day of the week. To add to the chaos of creating printable documents, I also created a seizure/activity log, and a how-to guide on how to fill it out, quick reference guide describing in detail how her seizures present themselves, what to do when she has a seizure. The most important bit of information, when it’s acceptable to give the rescue meds. There is a medical form that the school provides and has her neurologist complete with a pretty brief and vague description. We provided details on what to look with the specific type of seizure, how long to wait before administering the meds (which matched the doctor’s orders). As a parent, I wanted to make sure that if they had any questions, we’ve covered it in either meeting with the teacher/staff or in this notebook. I wanted them to know my daughter, and at the very least have something they could reference when we couldn’t be there to explain. I remember when she aged out of Early Steps and we decided to enter her into the school system. It was day three of school and I got a phone call from the nurse. The nurse was not panicked at all but was concerned that Riley couldn’t be soothed. Riley was crying was in discomfort. We talked through what they have tried. Apparently, that did the trick. She sent me a text about half an hour later to let me know she was fine now and that she was just gassy after lunch. How would she have known to try that? A simple thing for us at home, we know what works with what type of cry she has. How can I help teachers going forward to help my daughter when I can’t be there to assist? What happens if they can’t get a hold of me? This has helped tremendously with my own fears of having her in school. What has now happened… I’ve created a monster. A monster of a binder with organization at its core. This is a beast. I started off with a 2-inch binder that was super-duper cute, pink with glasses wearing owls. Then I realized that wasn’t going to cut it. The expansion project began and so did the tweaking. Do you ever get started with a project with a clear idea in your head? You get halfway through and that vision has changed 15 hundred times. This bad boy is finally printed, punched and put together. Then it hits you: you forgot important items, it’s not quite organized correctly, what you thought was a great idea at the time wasn’t. Back to the editing board. The best part about this process, it’s constantly evolving. Graphics, fonts, inserts, order. Lessons learned from using it myself. 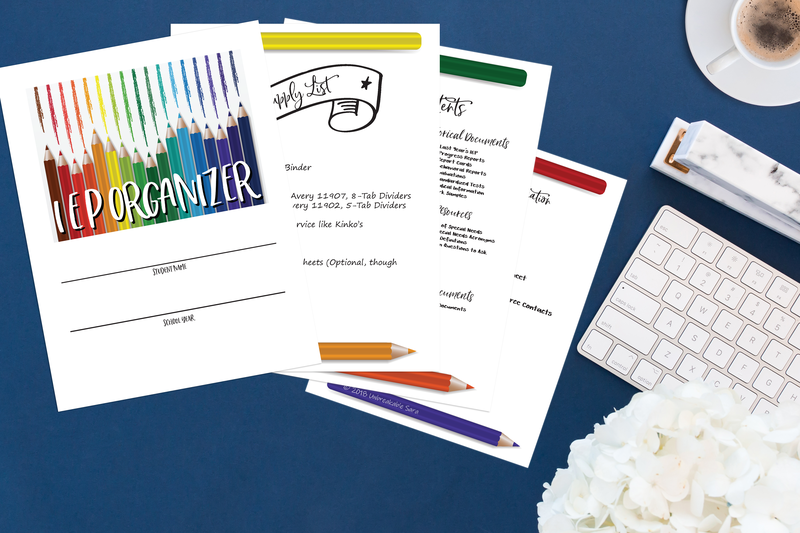 What we have now is a pretty sleek and easy to use IEP Organizer, grab yours today here. Best part, since you’re most likely here for the blog post, you get a huge discount. Big! Ginormous! It’s currently listed in the shop here for $4.99. That’s a steal. Below is a supply list for the binder to help you start your own. Please note these are all affiliate links from Amazon. I made most pages fillable, meaning you can fill out the information in the PDF on your computer before printing, simply because this makes things cleaner. I have horrible handwriting. Made a mistake? Need extra pages? No worries, the document is yours. Print off as many copies of pages as you need. Also, when I update the document you’ll get an email notification and free download to updates for life. We use the communication section to and from the school the most. As a result, this is by far the most useful section. We get weekly reports sent home from the school. This is also where we keep copies of doctors notes we send in for Riley to be excused. We make copies of everything and put it here. I’ve referenced the medical documents on multiple occasions. I also keep extra copies of my daughter medications handy for when the school asks, which they have twice now this year alone. The business card holder in the contacts section is really valuable. Especially if you’re a busy mom like me, and don’t have a ton of time to update contact lists on the regular. It’s really helpful to keep all the specialists all in one place, and it’s really easy to just drop the card in and move on. Then a couple of times a year you can update the contact lists. I’ve now begun crafting a binder for my “typical” child (anyone else not a fan of the typical vs. atypical labels?) for his pre-k school. The amount of paperwork coming home is ridiculous! Have questions? Comments? Concerns? Drop a note in the comments below! Send us an email at sara@unbreakablesara.com. Feeling really ambitious? Sign up for our email list to be the first to know about upcoming sales, new products and more! Want to join the conversation? Head over to the Facebook business page and/or join our private group for more personal discussion. Sometimes we just need a place to connect with other people who understand. Subscribe to join our email list and be the first to know about sales, news and more!